Join us for a full day of family learning. 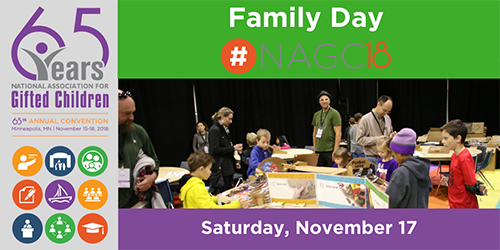 Where: Minneapolis Convention Center, 1301 Second Ave S.
Children's activities geared for elementary and middle school aged children will be held in classrooms in the NAGC18 Exhibit Hall. Children can join parents at sessions by nationally known speakers on parenting gifted children. Or, take advantage of any of the 150 other NAGC18 Saturday sessions. Children must by accompanied by an adult. Grades K-2: SOLD OUT Physics Fun with Northwestern University Center for Talent Development A toy car racing around a vertical loop without falling seems like magic, but it is physics! Discover the principles of motion, heat, thermal energy, moving electrons, and their charges. Engage in an exciting array of activities, experiments, and discussions that relate directly to the world students know. 2:45 PM Grades K-2: Intro to Coding & Robotics with Northwestern University Center for Talent Development Using age-appropriate technology tools, learn how to tell robots where to go, and what to do as you navigate them through a variety of paths and/or routes using your own original written programs. Represent code in a variety of ways using words, symbols and more. Explore fundamental computer science concepts through hands-on activities that may include dramatic play, construction, literature, and more! Parents, teachers, and counselors, often describing sensitivity and intensity as hallmark traits of gifted children. Kazimerz Dabrowski identified five forms of mental functioning (psychomotor, sensual, intellectual, imaginative, and emotional), called overexcitabilities (OEs), that contribute to the developmental potential of the gifted. This presentation provides an introduction to the OEs that provide gifted children experience and strategies to assist caregivers in approaching the dynamics or overexcitabilities from a positive and proactive perspective.